Because of the high stakes involved, owners of larger or public jobs require contractors to obtain a surety bond. As you’re likely aware, this is an agreement between you, the owner and a third-party surety stipulating that you’ll complete the job successfully and, if you don’t, that the owner will be financially protected from the resulting losses. Before issuing a bond, a surety will thoroughly investigate your company’s reputation, work experience, financial position and credit history. Its goal is to prevent losses; so the surety will look at a variety of factors to determine whether you’re truly capable of performing the work. Bonding involves many financial metrics. But the foundation of it all is your business reputation. Anyone entering a contractual relationship wants to know that the other party is trustworthy. And sureties don’t just want to know — they’re going to find out. To foster that trust, prioritize and nurture positive relationships with your architects, owners, subcontractors, employees and suppliers. You can present yourself to a surety underwriter in the best light possible only when you confidently believe others will attest to your company’s character. A surety will closely review your financial statement, paying special attention to items such as net worth, cash flow, work in progress and accounts receivable. For example, it will deduct current liabilities from your current assets to determine the strength of your capital position. In addition, it will calculate your cash flow by taking net income plus depreciation and other noncash items and then deducting principal payments on any debts. It will also analyze the profitability of jobs in progress, and the nature and extent of your backlog. Deferring payment of bonuses or other expenses. You may also need to upgrade the quality of your internal reporting system if it’s not providing adequate or timely information. Before issuing a bond, a surety will need assurance not only that your company is solid financially, but also that you have the experience and resources to get the job done. So it will seek evidence that you’ve successfully handled similar projects in the past. Moreover, you must show that you have the equipment to do the work or the realistic ability to obtain it. Having an established relationship with a bank and an adequate line of credit is helpful in this regard. Furthermore, today’s sureties will look at your human resources. This includes verifying that you have experienced supervisory staff, as well as enough crew members with the skills required for the project in question. If your reputation is the foundation of your bonding capacity, your ability to communicate is its pinnacle. Keep your surety well informed of any developments affecting your financial performance — either positively or negatively. Problems that threaten your ability to meet contract obligations can often be mitigated if addressed sooner rather than later. But it bears repeating: Tell your surety about good news, too. Keep them in the loop about exciting strategic developments, and don’t be shy about reminding them when you’re running ahead of schedule and under budget. Regular (monthly or quarterly) financial reporting is a good way to ensure an uninterrupted bonding pipeline. Whenever a bond is required, issuing a timely financial statement will greatly facilitate the process. 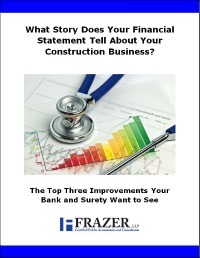 So don’t go it alone ― contact Frazer, LLP to give your surety the information it needs.